In one of the previous post we saw how serverless code works with AWS Lambda and API gateway. For this particular post we are going to use postgres DB. This post is about the lambda function so this assumes you have postgres DB running in RDS and have it's endpoint. username and password handy. https://www.pgadmin.org/ : If you want a GUI based client to test postgres on local try using pgAdmin. In first part we create a pool of connection giving required parameters to connect to postgres DB. Notice how we are reading these parameters from environment variables. In the callback we can execute client.query() and pass a callback to get rows of data we need for the employee table. Finally we iterate over each record using async and print the employee record name. You can end the pool when all the DB operations are done. By default AWS Lambda has internet connection. So it can access web resources. 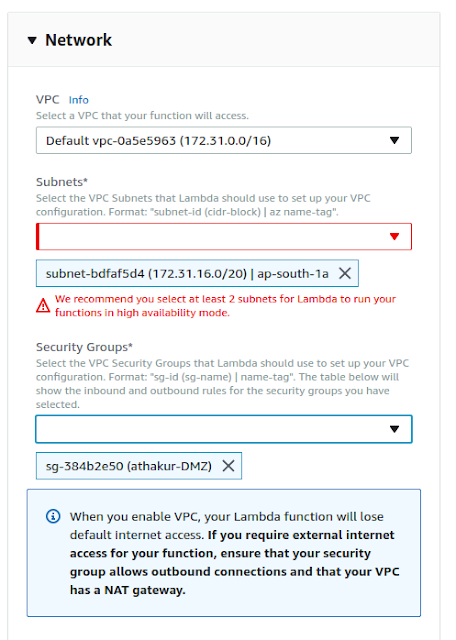 Lambda by default does not have to AWS services running in private subnet. If you want to access services in private subnet eg. RDS running in private subnet then you need to configure the VPC, private subnet to run lambda in and security group is network section of Lambda. However once you do this you will no longer have access to internet (since it is run in private subnet now). Now if you still need internet access then you need to spin up a NAT gateway or a NAT instance in public subnet and make a route from private subnet to this NAT. Note if you are encrypting lambda environment variable using KMS you will require internet access (KMS needs that). So if your RDS is running in private subnet you need to follow above steps to make it work. Else you are going to get bunch of timeout exceptions. Also note maximum run time of Lambda is 5 mins. So make sure your lambda execution completes withing that time. You should probably limit the queries returned by DB and process that much in one Lambda execution. You can also run lambda as a batch job (using cron expression) from cloud watch.